Thank you for considering Seguno! We hope this content helps during your evaluation and migration but please reach out to us with any other questions you may have. You can reach us via any of the contact methods at the bottom of this article. Do I need a third-party tool to sync my Shopify data into Mailchimp, such as ShopSync? We realize this is a difficult time for merchants and want to make your migration to Seguno as enticing and seamless as possible. With that in mind, we have decided to raise our free tier limit from 250 all the way up to 2,000 subscribers to match Mailchimp's free tier. All features and unlimited sending are still included. Install before May 1, 2019, to lock in your free tier at 2,000 subscribers. That means it would remain free for as long as you have 2,000 subscribers or less. We hope this really helps make things easier for you. Only if you plan to continue using Mailchimp as your email marketing platform after the May 12th deadline. If you are migrating to a new solution before May 12th then you do not need ShopSync or any other third-party tool. In fact, we strongly advise against ShopSync at this time as our tests have seen it wrongly resubscribe contacts. We have made importing and syncing your existing Mailchimp contacts as simple as possible with our built-in integration. You can go to the Settings page within Seguno and look for Mailchimp under Connections. From there, you can click the Connect button to log in and then select which list to use and whether you want tags added too. After clicking this new Connect button, we will begin syncing your contacts from Mailchimp to Shopify. This connection transfers the contact's email, first name, last name, and subscription status into a customer record in Shopify. We will also sync any unsubscribes that occur from a Seguno email over to Mailchimp to make sure any existing emails you are using in Mailchimp won't be sent to customers who have opted out of marketing emails. This provides you the smoothest transition possible as you move your email marketing to Seguno without disruption of your existing automations in Mailchimp, all while maintaining compliance with anti-spam laws. You then have an option to sync subscribers that first come into Shopify to be synced over to your Mailchimp list. This is helpful for when customers opt in at checkout. 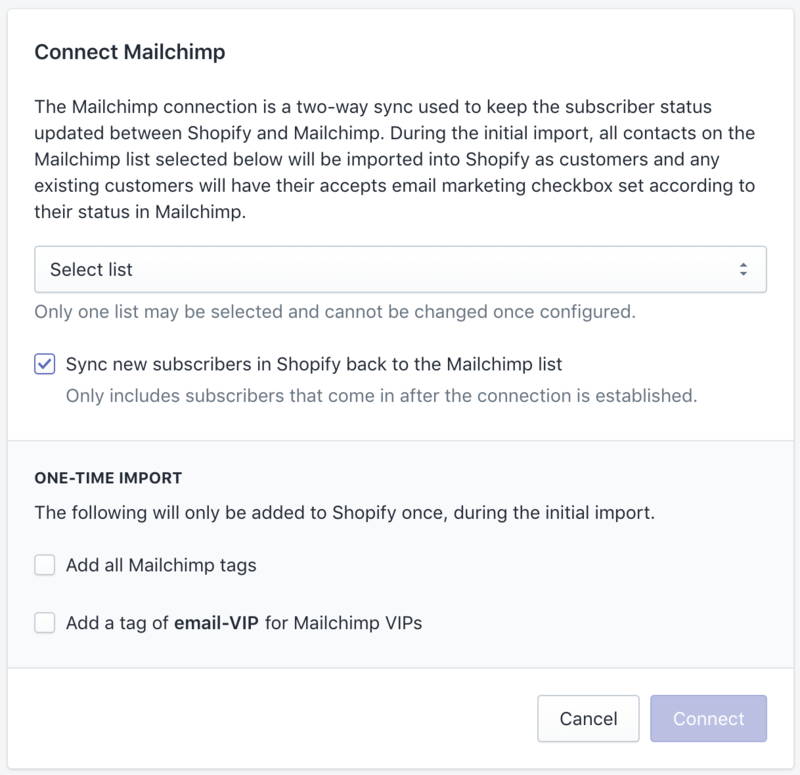 Lastly, you have the option to import Mailchimp tags as well as the Mailchimp VIP status as tags in Shopify. This is only done once during the initial import. Export your data from Mailchimp to retain a backup copy. Connect Seguno to Mailchimp with our built-in connection to migrate your contacts and their tags over to Shopify. Design your Welcome automation within Seguno and any other automations you'd like to use. Remove or deactivate any Mailchimp pop-ups and switch to either use your theme's pop-up and/or our email capture banner. Our banner app is free for Seguno users when you install it from the "Grow your subscribers" dashboard card within Seguno. If you don't like those options, any pop-up app that properly syncs signups into Shopify as 'accepts email marketing' will work and properly trigger the Seguno welcome automation. Privy has a generous free plan, just be sure to enable their contact sync. Evaluate whether you have any Mailchimp signup forms elsewhere, such as on social channels and replace them in a similar fashion. Remove the Mailchimp form URL from the Newsletter theme settings in the Shopify theme editor or replace any embedded Mailchimp signup form with a native Shopify newsletter form. Deactivate your automated Mailchimp campaigns. Activate the Seguno Welcome automation and any others you'd like. Spam Protect keeps your list clean. It will monitor your account and unsubscribe bad emails before they hurt your deliverability. Learn more here. Domain authentication allows the emails to be sent from your domain to establish trust and build your own, isolated reputation. This is a simple process but we're happy to help and if you're using Shopify as your domain host then we can actually handle the entire process for you. Domain warming automatically throttles your first newsletter send to help introduce your domain and typical volume to inbox providers. We also leverage your order data in Shopify and email engagement data from Mailchimp to automatically sort them so your most engaged subscribers receive it first. You'll see a banner at the top of a newsletter detail page describing that with an estimate of how long it will take. So, just design a nice, enticing newsletter to send to all your subscribers and we'll do the rest. Can I copy over my email templates? No, you will recreate your emails within the Seguno editor. To get you started quickly, we have pre-built emails for each automation as well as some newsletter templates. Use the "Talk to support" button inside the app to send us a message. Send an email to help@seguno.com. Schedule a demo: click to pick a time. Call 1-888-734-8661. Normal business hours are 9-5 Eastern on weekdays.